Prime Minister Mihai Tudose participated from December 8 to 9, in the second quadrilateral meeting of Romania, Bulgaria, Serbia and Greece. Serbian President Aleksandar Vučić, Greek Prime Minister Alexis Tsipras and Bulgarian Prime Minister Boyko Borisov attended the meeting in Belgrade. The topics addressed by officials from the four countries focused primarily on regional cooperation from the angle of common interests of ensuring prosperity and security. In this respect, discussions focused on cooperation on transport and energy infrastructure projects, as well as projects to capitalize on the current economic development potential. The regional policy issues were high on the talks agenda, the support and common interest in Serbia’s advance on the European path being also highlighted.
" Serbia’s borders with the EU are represented by us: Greece, Bulgaria, Romania. Serbia's integration is carried out through shared infrastructure, through cultural exchanges, Serbian students studying in Timisoara, through construction of roads, highways, energy infrastructure, IT infrastructure, after all, effective accession will be just a formality for which all three EU countries here committed to grant support as much as possible. And support may be not necessarily the word, but rather facilitating both during Bulgaria's and then Romania's [EU Council] Presidency in 2019 everything in terms of assistance and guidance for this formalisation of Serbia's status in the European Union”, stated Prime Minister Tudose in a joint press conference held at the end of the Quadrilateral Meeting. The Head of the Romanian Executive has shown that such meetings can lead to finding common solutions to any kind of problem encountered by the four states. In this respect, they decided that from now on, the four countries' relevant ministers should also attend these meetings, depending on the issue being debated. Prime Minister Mihai Tudose announced at the same time that the next four format meeting will take place in March, in Bucharest. 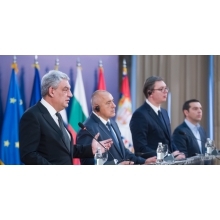 The Romania - Bulgaria - Serbia - Greece quadrilateral meeting is the second in this format after the one in the Bulgarian city of Varna in early October. I begin by extending our heartfelt thanks to our hosts: the president and his people. Mr. President asked how we felt here. My answer: we felt at home. So did feel my colleagues who visited Serbia and got in contact with the Serbian people and not only now, but also years or decades ago, they felt at home when they were welcomed here. I will not repeat the projects that my colleagues have already presented, I will only highlight several aspects. We are talking about Serbia's EU integration? This is where we take hands-on action. Serbia’s borders with the EU are represented by us: Greece, Bulgaria, Romania. Serbia's integration is carried out through shared infrastructure, through cultural exchanges, Serbian students studying in Timisoara, through construction of roads, highways, energy infrastructure, IT infrastructure, after all, effective accession will be just a formality for which all three EU countries here committed to grant support as much as possible. And support may be not necessarily the word, but rather facilitating both during Bulgaria's and then Romania's [EU Council] Presidency in 2019 everything in terms of assistance and guidance for this formalisation of Serbia's status in the European Union. I would like to thank once again the initiator of this approach, as all four states have issues. There is no issue that cannot be overcome and there are even several solutions to each one. What this kind of meeting does is harmonize solutions, for all four countries to have the same solution. Moreover, last evening we decided that from now on the four countries' relevant ministers should also attend, be they Transport, Infrastructure, Energy, Foreign Affairs or Interior Ministers, because another common issue is represented by the phenomenon of migration. In this respect, I am honored to announce that the other three of my colleagues and friends accepted the invitation that the next four format meeting is held in early March in Bucharest, followed by one in May, in Greece, and these meetings will no longer be an extraordinary event by their mere existence, but rather by their extraordinary outcomes. I would like to thank you once again Mr. President Vučić, to thank the Serbian people, the two friends for the opportunity to be here today and make decisions which I hope, would impact in a decisive and positive way our citizens and nations. Thank you, once again! Reporter: Good afternoon. One question for you too, Mr. President. Since you mentioned peace and stability, there were more heated discussions internationally, following President Trump’s announcement on Jerusalem’s recognition as capital of Israel, and also heated reactions from Hamas which demanded the third Intifada, while Al Qaeda called to war. What war, armed conflict potential can there be, based on this situation, especially in the light of latest events in Lebanon, and how can this affect our countries here, in Western Balkans, and why not, in EU? Thank you. Mihai Tudose: We talked about globalization, interconnection, there are no longer conflicts that are near or far. From this point of view, any zone or conflict jeopardizing the stability and safety of our citizens, is of concern. We express as Government of Romania, the same position, of involvement alongside EU partners, in solidarity, with NATO partners too, for any effort leading to stability and security in the area.